Is it possible with QGIS 2.14 and/or the Qgis2threejs-plugin to create 3d objects that don't "start" on the ground level (z=0), but are 3d objects "flying/floating" in the air? For example wind turbines (their blades), bridges or certain towers or structures with overlapping elements. If this is possible with Qgis, how can it be done? It's possible to do some quite clever things in more recent versions of qgis2threejs. For example, you can make "trees" by adding spheres slightly above the ground, and cylinders on the ground. For example, the blog post Further adventures with 3D GIS by Nicholas Duggan shows what can be done and how to achieve it. You need a 3D viewer to do that. In QGIS have a look at NVIZ, available through the GRASS plugin. However, in my experience, this will almost certainly not give you a sufficiently satisfactory result. You are better advised to export your data and create a 3D scene in a 3D modelling package like Blender or Unreal (or even X3D) - other solutions are available. Search this site for more information on these alternative approaches. 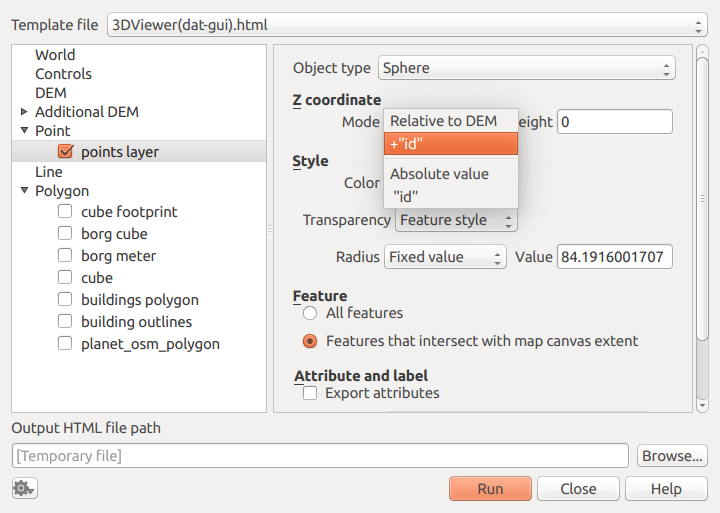 QGIS 3.0 will support rendering of 3D models out of the box. Install the latest nightly build of QGIS using OSGEO4W or another installer for your platform. In style panel, enable 3D renderer. Not the answer you're looking for? Browse other questions tagged qgis 3d 3d-model qgis2threejs or ask your own question. Turning Polyline with Multiple Segments into One Single Line in QGIS? Is it possible to render several DEMs simulatneously with QGIS2threejs? Seeking QGIS 3.0 ways to create browser based 3D scenes like qgis2threejs plugin does?